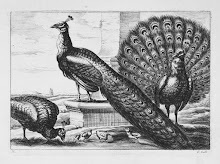 For ancient cultures the Peacock became a symbol of rebirth and immortality. The bird lost its tail feathers each year only to re-grow them and it was believed that their flesh did not decay after death. Peacocks are the perfect symbol for renewal on the cold days of winter. 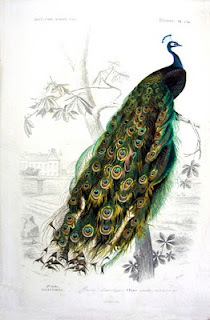 French naturalist Charles D'Orbigny (1802-1857) did highly detailed and scientifically accurate illustrations of nature including his rendering of The Peacock from Dictionnaire Universel d'Histoire Naturelle. Edgar Maxence (1871-1954) was a French Symbolist who studied under Gustave Moreau. 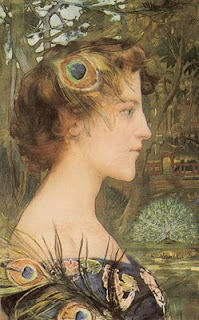 Influenced by early Italian Renaissance and late English Pre-Raphaelite artists he painted Portrait with Peacock, using gouache, pastels and silver foil. 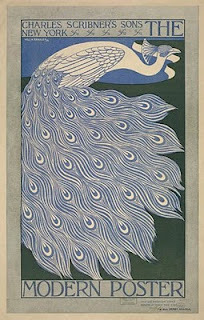 American Art Nouveau illustrator and artist William H. Bradley (1868-1962) studied the Arts and Crafts Movement and Japanese block prints. His bold, elegant style can be seen in his depiction of the immortal Peacock.